Jeremy Dickinson was born in the U.K. in 1963. He graduated from Goldsmith's College in London in 1986 and he still lives and works in London. He has had solo exhibitions in many places in Europe and the U.S., and this is his fifth exhibition at Tomio Koyama Gallery. 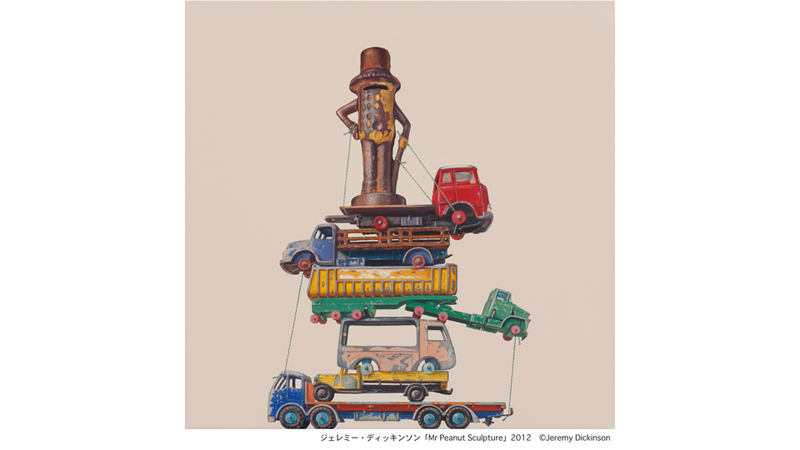 As a motif he uses the miniature automobiles that he has collected since he was little to create paintings. The array of model cars, trucks, trains, and various buses ranging from local buses and school buses to double deckers, summons recollections from our own childhood. Also, from the landscape and sunlight reflected through the train window, and the precisely detailed depiction of scratches and peeling paint, we can interpret the time that the artist shared with these motifs, as well as feel the affection and warmth that English people have for things that have traditionally existed in the U.K. Contrary to the cars' precise details, the backgrounds are uniformly plain, which not only serve to illuminate the colors of the cars but also to trigger viewers' imaginations. Please visit to see his works which transform memories of the past into a new realm of imagination.